In this case these words of our Lord Jesus Christ seem to be the primary principle of evaluation: 'You will know them by their fruits' (Mt 7:16). The fruits of Tesla's work are light-giving both in a literal and spiritual sense. On one hand, he has ushered the world into a new era of civilization: the age of electro-magnetic powering and such like industry. Need I mention, to list but a few contributions, his revolutionary AC induction motor and transformer, or his systems for wireless transmission of power and information, or his colossal contributions in other fields such as X-ray analyses, radio communication or remote control, anticipations of the internet and mobile telephony notwithstanding. On the other hand, he was a light himself, but in an additional — I'd say, in a spiritual sense. For Tesla was a 'revelation' of the mystery of light as a person as well. As a scientist he is probably one of the most important inventors of all time. As a person he is doubtlessly a remarkable example of ascetic self-restraint, a man committed to purity of thought and gentleness of conduct. On both levels he has done us inestimable good. To give light to others is good: to be good is enlightening to others. Tesla was both. Therefore, the Serbian Orthodox Church has never hesitated to recognize Tesla as one of her own. I shall go further and say this: there is a bond, a special one (yet to be explored apophatically), between the person of Nikola Tesla and what I perceive as the light-gifting energies of the Holy Spirit. These are given to all creatures by our Lord Jesus Christ — the Logos through whom all things are made (Jn 1:3; Rev 4:11). As He Himself says: "I am the light of the world; he who follows Me will not walk in darkness, but will have the light of life" (Jn 8:12). 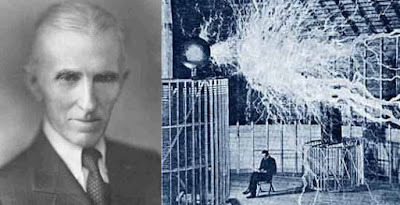 In reference to that, the iconic image of Tesla sitting amongst lightning released by his magnifying transmitter in the Colorado Springs laboratory, with a book open in front of him, seems to be a prophetic spiritual event also, not only an amazing display of a scientific super-genius at work. For it is an image of communion with the physical and metaphysical sides of the mystery of light, at the same time — a sublime initiation into the beneficent workings of Light. "I see a friend hurt, and it hurts me, too: my friend and I are one. And now I see stricken down an enemy, a lump of matter which, of all the lumps of matter in the universe, I care least for, and still it grieves me. Does this not prove that each of us is only a part of a whole?" "Many a year I have thought and pondered, lost myself in speculations and theories, considering man as a mass moved by a force, viewing his inexplicable movement in the light of a mechanical one, and applying the simple principles of mechanics to the analysis of the same until I arrived at these solutions, only to realize that they were taught to me in my early childhood. These three words [food, peace, work] sound the key-notes of the Christian religion. Their scientific meaning and purpose now clear to me [...]: to increase human energy. When we recognize this, we cannot help wondering how profoundly wise and scientific and how immensely practical the Christian religion is, and in what a marked contrast it stands in this respect to other religions" (PI 192–193). It is a quintessentially distinctive mark of Christianity not only to 'tolerate' one's enemy, but to love him regardless of his hostile hatred. As is said by Christ himself: 'Love your enemies, do good to those who hate you, bless those who curse you, pray for those who abuse you. To him who strikes you on the cheek, offer the other also' (Lk 6:27–29; Mt 5:39). Hence these thoughts are laid par excellence in the Christian spirit. And there is more to be added here, for, as we can see, the mentioned words are a clear example not only of Tesla's firm belief in the primordial equality of all human beings, as persons —a sense of unity appropriated through spiritual empathy — but also of the fact that he believed that all human beings reach their full potential by living according to what he thought are key postulates of the teachings of Christ and his followers, and, furthermore, he ventures to deduce scientific implications of the listed precepts of Christian religion which, he adds, is special and different in relation to others. "Religion is simply an ideal. It is an ideal force that tends to free the human being from material bonds. I do not believe that matter and energy are interchangeable, any more than are the body and soul. There is just so much matter in the universe and it cannot be destroyed. As I see life on this planet, there is no individuality. It may sound ridiculous to say so, but I believe each person is but a wave passing through space, ever-changing from minute to minute as it travels along, finally, some day, just becoming dissolved." "For ages this idea [that each of us is a brother/sister and part of a whole] has been proclaimed in the consummately wise teachings of religion, probably not alone as a means of insuring peace and harmony among men, but as a deeply founded truth. The Buddhist expresses it in one way, the Christian in another, but both say the same: We are all one" (PI 177). Finally, these words (taking their queue from Aristotle), are indicative in the widest theological sense: "... I am convinced that the whole cosmos is united both in the material and spiritual sense. Within the universe there is a centre (jezgro) wherefrom we receive all our strength, all inspiration: it attracts us; I feel its power and values which it emits to the whole of the universe and thus keeps it in harmony. I have not fathomed the mystery of that centre, but I know it exists, and when I wish to give it some material attribute, then I think it is Light, and when I try to understand it spiritually then it is Beauty and Charity. The one who carries this faith inside feels strong, labour is a joy to him, for he feels himself to be a tone within the universal harmony." The arguments proposed above suffice for us as the Serbian Orthodox Church to endorse Nikola Tesla as one of our own. This ensues from the universality of the Orthodox Church's spirituality, doctrine and faith, particularly from its capacity to endorse otherness economically (oikonomia). It is precisely this that allows us to elevate Nikola Tesla as one of our own, although he belongs to all of mankind, despite — or because of — his unprecedented uniqueness. He was the son of Milutin Tesla, a Serbian Orthodox priest who exposed him to the wonders of the Divine Liturgy at his parish church, in which he rung the bells (although, as a boy, he felt uncomfortable for having to be in church on each Sunday); he was the son of Georgina-Đuka Tesla (born Mandić), her father and brother too being Serbian Orthodox priests; he was baptized in and through the Serbian Orthodox rite, by priest Toma Oklopdžija; he was most probably catechumenized by Orthodox priest Mile Lemaić (or Pilip Lemaić); all three of his sisters — Angelina, Milka, Marica — married Serbian Orthodox priests; Angelina's son, the learned theologian Petronije Trbojević (1876–1933), became the hegumen of the monastery of Šišatovac, and Tesla exchanged affectionate letters with his nephew; furthermore, his schooling was aided in a crucial sense by his uncle and benefactor – Metropolitan of Sarajevo Nikolaj Mandić (1840–1907); he regarded his personal copy of the Book of Holy Services (Služabnik, Venice 1519) as the most valuable one in his library; he was the president of the Serbian ecclesial-educational commune in New York; he was the Godfather of the Church of Saint Sava in Gary, Indiana (1938); he was awarded the St Sava Medal of the I Class (1892) — yet, he always spoke in non-chauvinistic and non-confessionalist terms – of God, of Christianity, of the fundamental unity and oneness of mankind created according to the image of a Higher Reality, that is, according to Light, Beauty and Charity. He was a Serb — yet he was an American; he was ours — yet he belongs to everyone. But so it is with Christ as well: he belongs to you and me in particular and to everyone 'in general', across boundaries of time and space, social and economic rank or those of race and gender. Such is the case with God and what is godly: Tesla was godly. He did not become a priest of the Serbian Orthodox Church, although his father prayed for this in all earnest — yet he became the priest of the science of light and energy, bearing fruits which we all see to be good. He was born in the village of Smiljane in the Balkans — yet his funeral service took place in New York at the Cathedral of Saint John the Divine, one of the most impressive Gothic cathedrals in the world; the funeral service was opened by Episcopal Bishop William T. Manning and concluded by Protopresbyter Reverend Father Dušan J. Šukletović, rector of the Serbian Orthodox Church of Saint Sava, together with Presbyter Father Milan Mrvičanin. Hence it is no surprise to find both Mihailo Pupin's and Nikola Tesla's busts dedicated and standing together next to St Nikolai Velimirović in the forecourt of Lower Manhattan's Serbian Orthodox Cathedral, note, of Saint Sava. It is safe to say that St Sava gave the light of the Orthodox faith to the Serbian nation, being himself a light of Christ by the Spirit. It is also safe to hold that the priest's son, Nikola Tesla, led the whole world into an era of radiance, energy and hitherto unfathomed development and propagation. Both men laboured for the common task, the good of all. All in all, on this 70th anniversary of Tesla's death we are compelled to repeat the words which his mother, the pious woman from Smiljane, uttered to her beloved son before drawing her last breath: "You've arrived, Nidžo, my pride." Let us sing Vyechnaya pamyat (Eternal memory) to our pride, to our Nikola Tesla! For we have inherited him and, at the same time, he has inherited us, the Church. „He who has ears to hear, let him hear" (Mt 11:15). According to: My Inventions: The Autobiography of Nikola Tesla, NuVision Publications, US 2007, these words also are Tesla's own: "The gift of mental power comes from God, Divine Being, and if we concentrate our minds on that truth, we become in tune with this great power. My mother had taught me to seek all truth in the Bible; therefore I devoted the next few months to the study of this work." Although widespread in and through numerous other versions of his autobiography, this sentence, however, does not appear in the 1919 text of N. Tesla's autobiography; vide: Nikola Tesla, My Inventions (Ch. V = "The Magnifying Transmitter"), as published in: Electrical Experimenter VII 2:74 (1919) 173. Still, the mentioned sentence is in some concordance with analogous thoughts Tesla expressed elsewhere and with circumstances of life or attitudes of his mind and heart — which may be reconstructed in favour of the above stated, and vice versa. In the mentioned edition of Tesla's autobiography — and in some others too — these words appear as well: "Peace can only come as a natural consequence of universal enlightenment and merging of races, and we are still far from this blissful realization, because few indeed, will admit the reality that 'God made man in His image' in which case all earth men are alike. There is in fact but one race, of many colours. Christ is but one person, yet he is of all people, so why do some people think themselves better than some other people?" (op. cit., 53). However, only the introductory part of this sentence appears in the 1919 text of N. Tesla's My Inventions (Ch. VI = "The Art of Teleautomatics"), as published in: Electrical Experimenter VII 6:78 (1919). Nikola Tesla, "The Problem of Increasing Human Energy: With Special Reference to the Harnessing of the Sun's Energy", Century Illustrated Magazine XL:2 (1900) 177 = abbr. PI. Orrin E. Dunlap, Radio's 100 Men of Science: Biographical Narratives of Pathfinders in Electronics and Television, Harper & Brothers, New York 1944, 122–123. According to the memoires of famous Yugoslav-Croatian sculptor Ivan Meštrović: "... [Tesla] told me how ever since his youth, before going to bed at night, he would be on his bare knees praying to God. [...] 'But, yes, I prayed like that all the way until I was fifty. Since that time I pray differently, but it makes no difference, nevertheless, for the essence remains the same, and I pray to God every day'" (tr. B.L.). Vide: Ivan Meštrović, Uspomene na političke ljude i događaje, Nakladni zavod Matice hrvatske, Zagreb 1993, 169–170. Vladislav Savić, "Nikola Tesla: Our First Great Amassador to the United States" = Vladislav Savić, "Nikola Tesla: naš prvi veliki ambasador u Sjedinjenim Američkim Državama", Biblioteka Nikole Tesle vol. 10, Društvо “Nikola Tesla” za unapređenje nauke i tehnike, Beograd 1952, 14 pp. This quote is from Savić's 1919 interview with Tesla. Although Tesla distinguishes Light in terms of a material attribute of the cosmic Centre (lit. nucleus = jezgro) in relation to the spiritual ones, i.e. Beauty and Charity, it is indicative that here appears a triadic structure of primary values. Still, this is more than remote from even a primitive triadology in the dogmatological sense. His nephew Sava Kosanović later gave this book as a gift to Harry S. Truman, president of the USA. Vide: Milovan Matić, "Tesla u okrilju pravoslavlja", Pravoslavlje 931-932 (2006) 30-32.